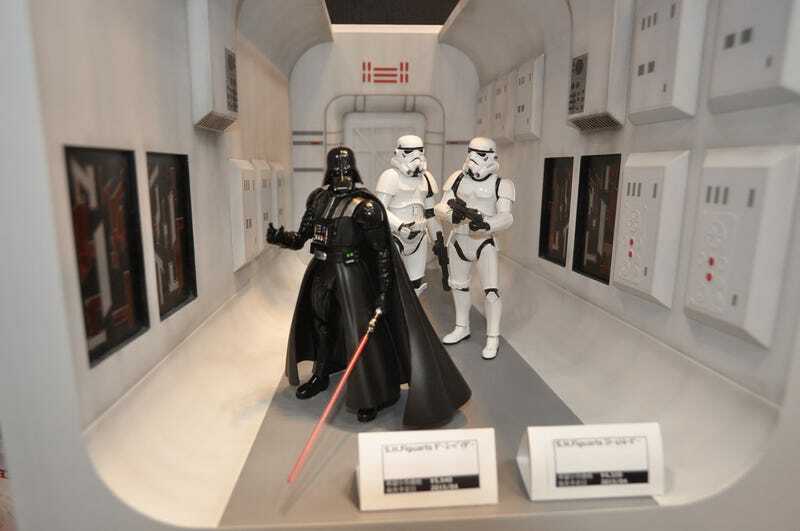 Disney's annual Japanese Expo is in full swing, and now that the giant owns Marvel and Star Wars, it means we get to see a snifter of some of merchandise for the two properties created by Japanese companies. Come see Hot Toys' Star Wars figures, A Hulkbuster figure and more, oh my! Kinda basic, but look how big it is! All Hulkbuster merch is good merch in my books. They call it a figure, but it's literally just half of R2, almost like it's a painted Carbonite slab. Huh! Presumably there'll be more pictures released by Hot Toys in the near future, but he's looking pretty good for now. Update: The Luke on display is actually an old Sideshow/Hot Toys collaboration figure released a while back, rather than a new toy made after Hot Toys got the Star Wars license. My bad! Thanks to RKoth for pointing it out! AAAAAAAAH GIANT EWOKS HAVE COME TO KILL US ALL. There's also a Giant Yoda at the link, but presumably they'll only be selling the slightly-smaller versions of these toys rather than the hulking plush monstrosities on display.